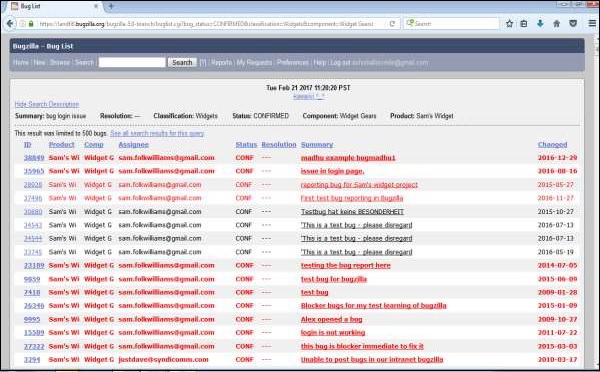 The Advanced Search page displays a list of all the bugs, which are filtered exactly with different criteria that have been loaded by the users. 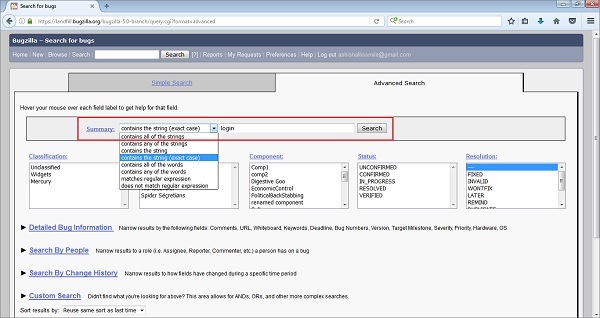 This Advanced Search feature selects different possible values for all of the fields in a bug. For some fields, multiple values can be selected. In these cases, Bugzilla returns bugs where the content of the field matches with any one of the selected values. If none is selected, then the field can take any of values. Multiple values selection for one field is based on the “OR” functionality. If either one or any other value is matched among the user selection, the bug will be displayed. 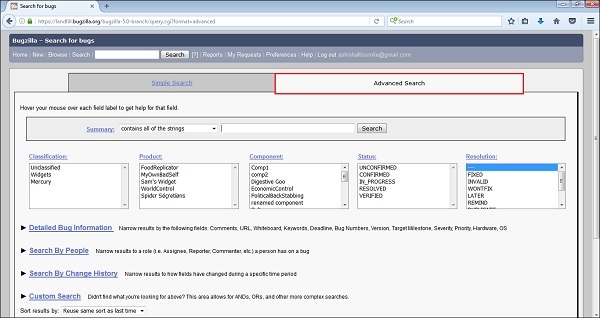 For using the advanced search feature in Bugzilla, we have to follow the steps given below. 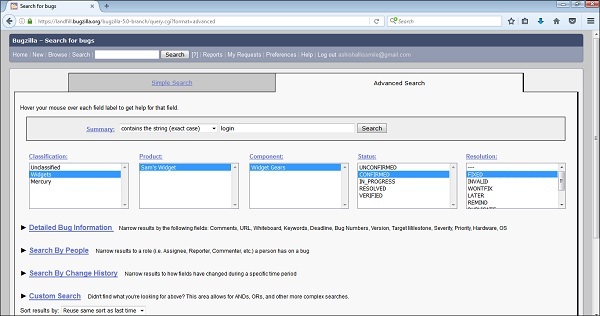 Step 1 − Click on the Search hyperlink on the header of the homepage. You will get two tabs, Simple Search and Advanced Search, click on the Advanced Search tab. Step 2 − Select the required option from the Summary field. Then, you can enter the keyword to identify or filter out the bugs. Step 3 − The next step is to select the category of Bug from the Classification box; here, we have selected Widget. Then, choose the Product under which the Bug is created; here, we have selected Sam's Widget. In the Component box, we have selected Widget Gears. In the Status box, click on Confirmed and in the Resolution box choose Fixed, all of these are shown in the following screenshot. Note − All these fields are optional and dependent on the user’s choice. Step 4 − Click on the Search Button after entering all the fields based on the requirement of the filter.